Wednesday morning we'll head down south for 10 days time. Looking forward to a typical 10 day trip - variety of fish from dorado to wahoo & the chance for 100-200# yellowfin tuna. While the first trips this season were pretty tough, the fishing is getting better. The RRIII's 14 day trip put some 150+ YFT on the boat, but they also passed over likely 200# stuff in the area we fished two years ago for the cows. If we see that stuff again it will fill up the fleet. We'll do some prospecting in that area and perhaps some lower banks. Hopefully we'll nail some 'hoo along the way, too. We'll have 20 folks on this exclusive charter*. Several manufacturers were nice enough to make some donations for this year's 10 day charter. Frenzy donated some nice pliers and flying fish, Seaguar Fluorocarbon, Strike Pro poppers, Rod Knobbie, Back Bone, Albackore, BlackWater Fluorocarbon, Catchy Tackle and Sea Strike Lures, QuickRig, Jerry Brown, Smitty Rod Belts & Gary Sato's Spectra Crimping System. For those going, see you on the boat. For those that couldn't make it, visit the RRIII website for a report on how we're doing. * I say exclusive for a couple reasons, first we do all the booking. Secondly, this year's passenger loads have been lesss than the past couple years, for all the landings. There have been some LR boats leaving with 15 or so passengers instead of 30, and some canceled trips, too. Not good for the boat owners and crew. However, for those able to go, it's a chance at an uncrowded rail, and nice fishing. I hope you have a fun and safe trip, wish I could be there. Mark, hope you guys have a great trip. I will just have to wait the 10 days to find out how the new HXJ performs. Looks to be a fish killer. Good luck and good fishing! See you in 10 days. Well we got back Saturday. Weird trip. We were limited load at 18 fishermen on the boat. 105 feet of boat, 18 great guys. The tuna were not playing for us or anyone else unless you hit Guadalupe and beat the sharks. Alijos wasn't working, outside Mag Bay showed some good fish but no biters. 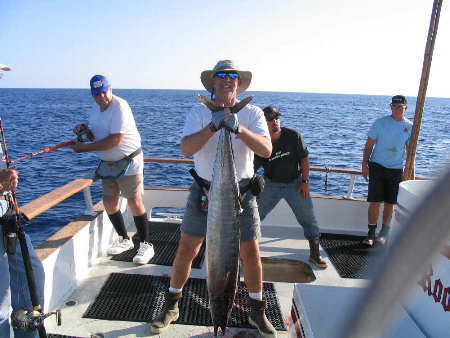 We caught limits of...marlin and mixed dorado of good size and wahoo in the most productive waters further south. Lots of life there, but no tuna. Ridge, no tuna but some 'hoo of 50# size for the bigger fish (nothing at 60+). Bottom line, nice time, wonderful boat and crew, varied bag of fish, decent action (over 200 marlin caught and released), no red meat, but always a great way to spend some vacation time.